Tree climbing is good exercise. Tree climbing is not only fun, but it's also an excellent workout. Though it's not nearly as demanding as it appears, climbing is great exercise for the arms, legs, and back. Climbers work many muscle groups they often don't use elsewhere. The extra bonus to this exercise is that it is stimulating and never boring. Tree climbing is very safe. When climbers carefully follow the basic "do and don't" rules, they are virtually assured of a safe climbing experience. 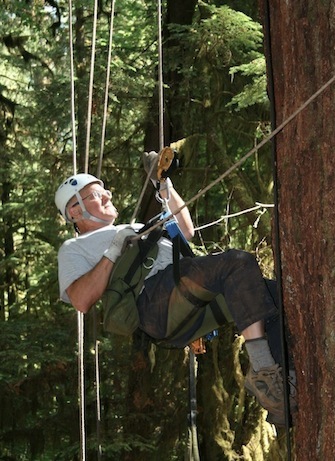 TCI has never had anyone fall out of a tree or get badly injured during one of our events. Trees are everywhere! You don't have to look far to find a good climbing tree, especially if you're in a natural area. Even in an urbanized setting you can usually find a tree worth climbing. Trees are alive and natural. There is something very wonderful about getting outdoors and into the branches of something which is alive. Humans find peace and relaxation there, as well as a totally different perspective on what they see during their every day lives. All your senses come alive. A whole new perspective is added to the climbing experience through the feeling of touch as the tree moves and sound as the wind whistles through the leaves. Tree climbing is cost-effective. Once you've made the initial layout for your basic gear, there are very few further expenses. You won't have to travel too far to find a tree, and you can climb most trees for free! You don't have to build an expensive structure. Rope courses, climbing walls, and alpine towers are expensive to build and maintain. They have to be continually inspected for defects because the structures are man-made. While trees need to be inspected every so often, there's no other work to do before you have a perfect climbing structure! Tree climbing is a year-round sport. During the hot months, you have the canopy to provide an awning for shade. In winter, the awning is taken down, and there's no barrier to the warm sunlight. Our dear friend John Gathright, founder of Tree Climbers Japan, and others wrote three articles about social and physical benefits of tree climbing. Read them for yourself!